Earlier this week, my mom sent me a very important email informing me that next Wednesday, March 14, is Pi Day. (Because the date is 3/14, you see.) She knows how I like to be kept aware of important holidays. Since my math education culminated in me failing goecalculebra or whatever we were supposed be learning in 11th grade math class (the only course I have ever failed in my life), my appreciation for pi is sadly somewhat limited. My appreciation for puns and wordplay, however, extends well beyond the limits of good taste, so for me this is an opportunity to turn numbers into letters and start talking about that delicious food of champions, PIE. However, there are about a million websites out there that can give you way better directions for pie-baking than I could. 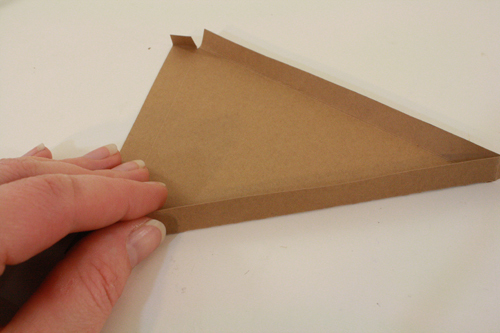 So I’m going to instruct you in pretend pie-making, since there are only maybe several thousand websites with better instructions for paper crafts. And you’re here already anyway, so why not just stick around? I promise there will be pie! 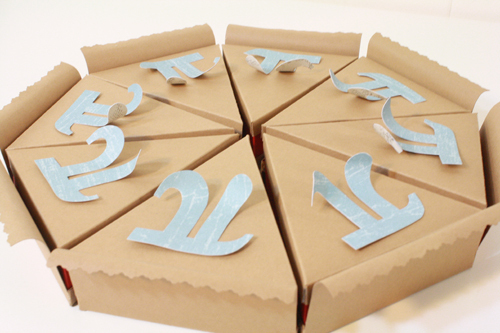 1) Download, print and cut out the paper pie gift box template. 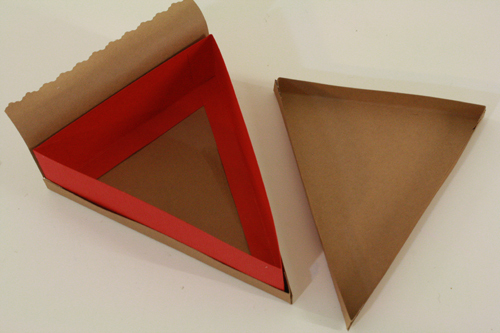 2) Trace the pieces onto your nice paper, the triangles onto the paper you want to use for the crust (the top and bottom of the box) and the rectangles onto the paper you want to use for the filling (the middle of the box). 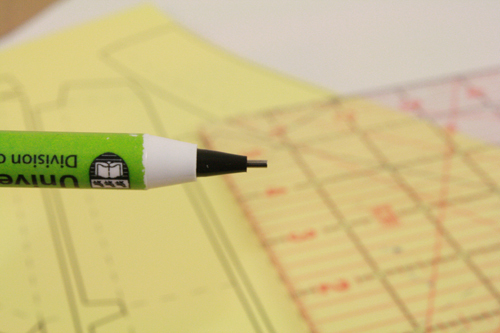 3) Without any lead protruding, use the tip of your mechanical pencil to score* along all the score lines (the grey dashed lines) marked on the template. 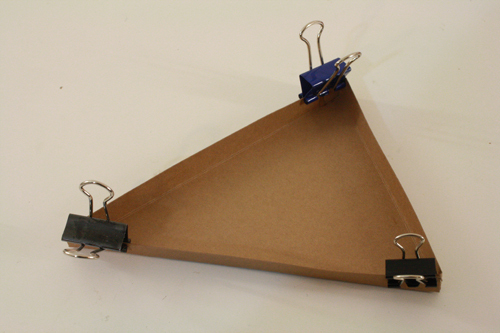 Even if you traced the cut-out template, you can still tell where those dashed lines go by looking at the little inverted triangle shapes where the tabs are at each corner of the triangle. 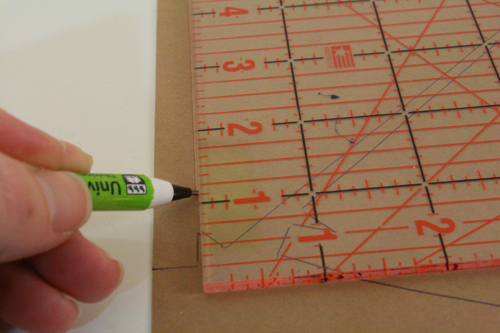 Lay your ruler straight from one tab indent to the next, and score along that line. *Scoring is when you make an indent the paper, but without going right through the paper. 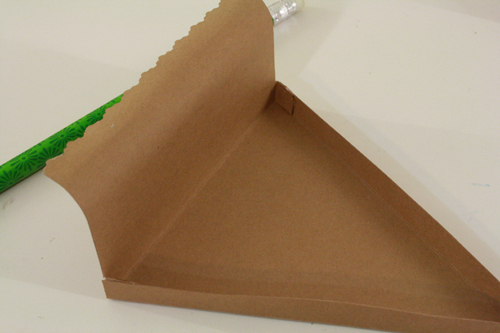 It makes folding thick paper much easier, and ensures that the fold line is perfectly straight. 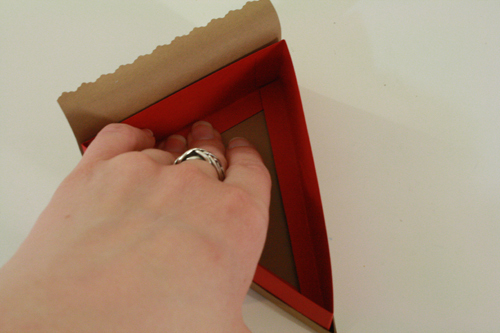 Make sure you score them quite deeply, just not deeply enough to make the paper tear or crack. Score along all the dashed lines on all four pie pieces. 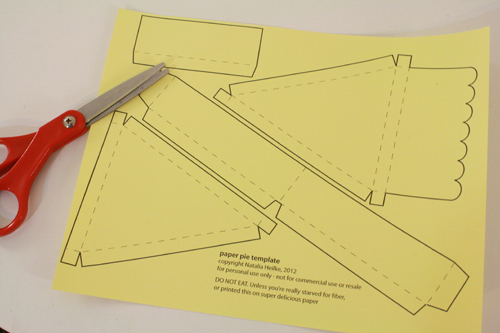 4) Cut out each pie piece. 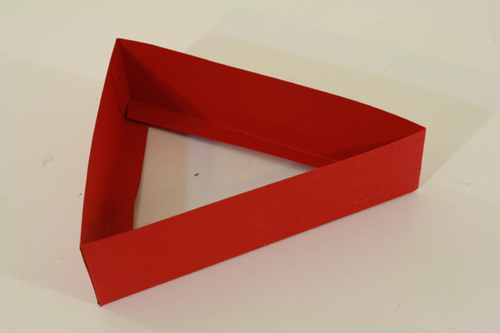 You can do steps 3 and 4 in any order, but I find it a bit easier to score the paper first, then cut the shapes out. Doing it in that order, I find the paper moves around less while scoring it. 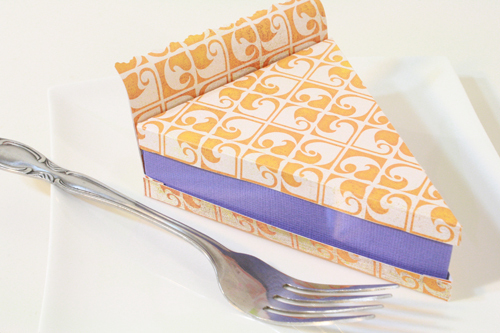 A tip about the bottom crust piece (the one that has the long rectangular bit with the ruffled edge): instead of cutting out each of those ruffles, I actually like to take a pair of fancy patterned scrapbooking scissors and just cut a line across the top of the rectangular section of the bottom crust. It’s much faster and less finicky, and looks just as nice. 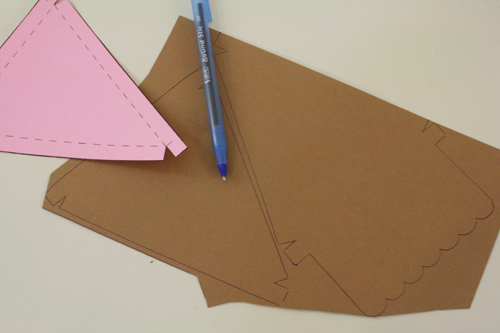 If you choose to do this, simply cut a line just underneath the template’s ruffles . 5) Fold along all of the score lines on all the pie pieces. 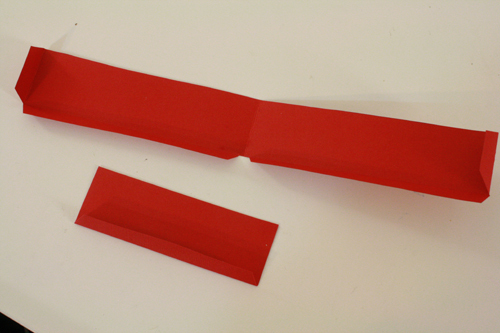 6) Take the bottom crust piece and glue each of the small tabs inside the folded-up edge next to it, making it into a 3 dimensional object with upright sides. 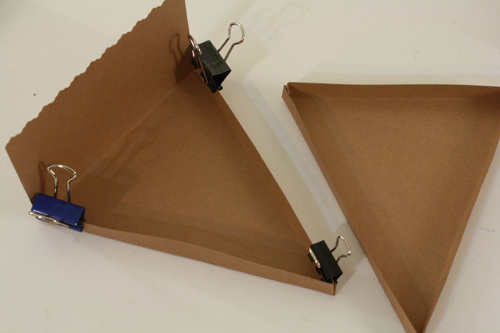 Use small binder clips to hold these tabs in place while they dry. 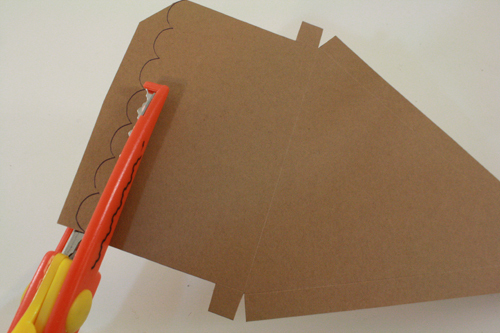 7) Use a pencil or pen to curve the ruffled end of the bottom crust piece. 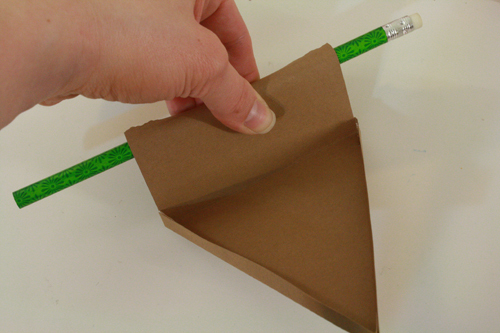 Just line the top edge of the paper up along the length of the pencil, and roll the paper around the pencil a little ways. This should give it a nice curl. 8) Take the top crust piece and glue the tabs in place the same way you did for the bottom crust. 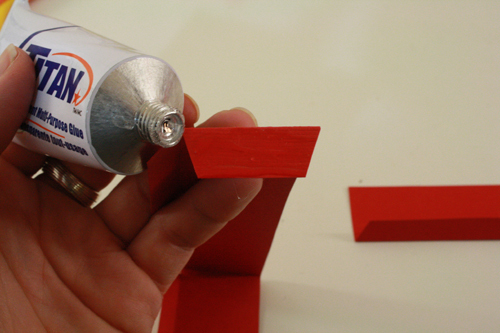 9) Take the longer filling piece and apply glue to the two short tabs at either end of the piece. 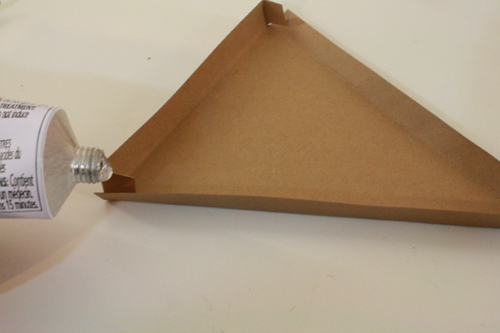 Attach these tabs to the inside of the short filling piece, so that the two pieces now form a triangle. 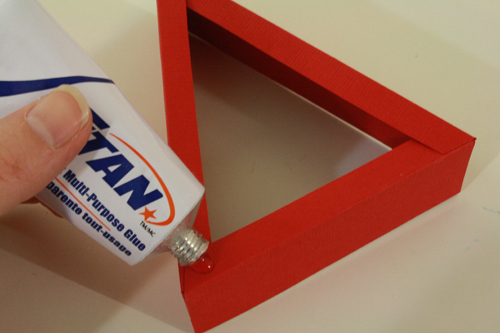 10) Apply glue to the long tabs on the underside of the filling triangle. Insert the triangle into the bottom crust piece, and press down on the filling tabs so they are glued down flat inside the crust. 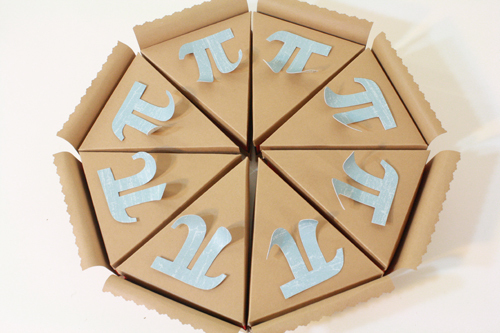 12) Fill with good things and give to someone you care about on Pi Day! 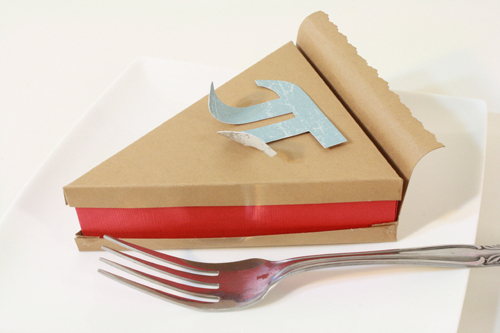 You could even fill it with a piece of pie. These are so cute they hurt my brain. I want to make them… or eat pie… I can’t tell. Thank you so much for sharing this project. I can’t wait to make some! If you would like me to take it down, just let me know! brilliant! I love this. Almost as much as I love pie. I would just like to say that you are a genius! Thanks, this is awesome. 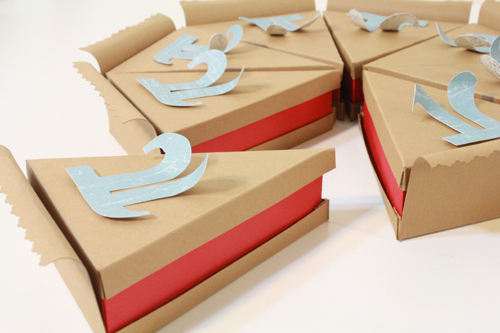 How do I download the paper pie gift box set? 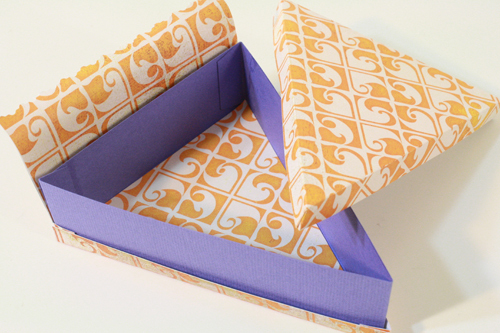 You should just be able to go to this page http://tallystreasury.com/patterns/ and click on “paper pie gift box template” to get the PDF. It’s number 13. on that page under “Paper patterns and templates.” If for whatever reason that doesn’t work for you, please let me know!